Sweetgreen continues to expand into California announcing on their website that they’ll be “Opening Soon” in Brentwood. With the news of the new Brentwood Gardens location, this will bring the number of locations in California to eight (mostly in the Los Angeles area)! Eight is still just over half of New York City’s 15 locations, but only a pair away from Boston and four fewer than their “hometown” in D.C. Yes, California is a big, honnking blue state, so eight ain’t that much. But we all know that sweetgreen made it clear that California is where they want their growth to be. “L.A. has always been where we wanted to go. 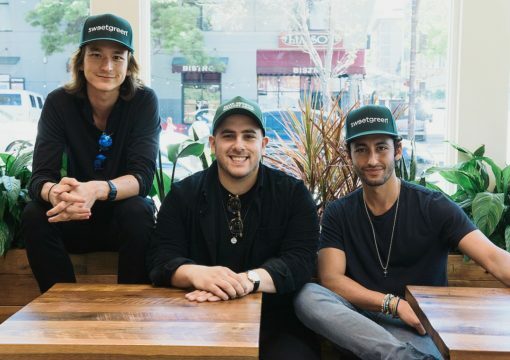 So much of what we consider ‘the sweetlife’ was inspired by L.A. and the way people live there,” Sweetgreen cofounder Jonathan Neman said to Business Insider. And sweetgreen should know — two of the three company’s founders originally hail from the Los Angeles area. When will Brentwood’s sweetgreen open? As always, sweetgreen is a bit hush hush on an opening date for their 11677 San Vicente location. A few bloggers noticed the branded plywood way back in early October and over the last few weeks, sweetgreen has posted jobs for team members, associates, dishwashers, line leads and managers for their Brentwood location on the job classified sites: Craigslist and Monster. Stay tuned. My sense it’ll be any day now.